I mentioned I had a great time picking in the McGill Ghetto during move-out day. That way was back at the beginning of May, but I haven’t gotten around to mentioning it until now. From what I hear move-out day is a phenomenon across the world. Basically, a lot of students move after their academic years end, and when people move they inevitably leave stuff behind. I wrote a fairly in-depth post about the event last year. In past years I’ve been busy or haven’t taken the day particularly seriously. This year though I decided to go out of my way to see what I could find. I went with a couple friends and even recorded a bit of video, though we haven’t done anything with the footage yet. There’s no shortage of things to be saved on move-out day. We (and many other scavengers!) saved lots of clothes, food, books, school supplies, and so on. I think I got particularly lucky this year though. All the stuff in today’s post came from a single spot, one of the first we stopped at. It’s hard to fathom why the previous owner threw these things away, though I’d guess that they’re privileged enough not to have to consider the financial implications of their actions. One of the things that has surprised me most in my garbage flipping career is the amount of money I’ve made from used perfumes. I had no idea that such a market existed before a couple years ago. The Replica perfume on the left for example sold quickly on eBay for 75$. 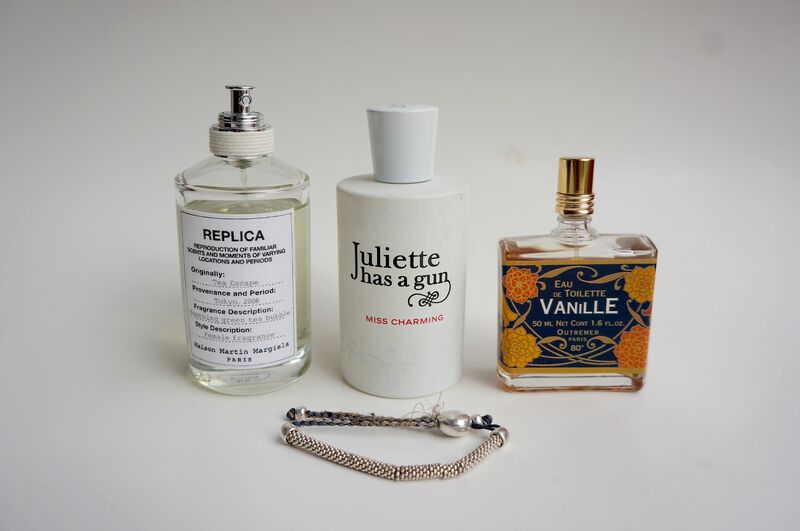 The “Juliette has a Gun” is listed for 60$, while the Vanilla one sold at a yard sale for 4$ (it was originally 20$ at Anthropologie). I’d guess that I’ve made around 2000$ selling perfumes in the last two years – that’s around 5% of my income! I also got 30$ for that Links of London silver bracelet, which I noted in my last post. I love finding cash in the trash. Easy money right? A lot of this change came from inside a laundry bag. I found more (including the bills) inside some used purses, and the rest was loose inside the bags. All in all it added up to around 40$. Click on the picture to see a GIF my friend made! We found three 24s of Sleeman’s sitting on the curb, while a bunch of other cans (some of which were still cold) and most of a bottle of Vodka were saved from the bags. This is easily 100$ of booze right here. Unfortunately I’m not a big Sleeman’s fan, but they have been useful as bartering chips. 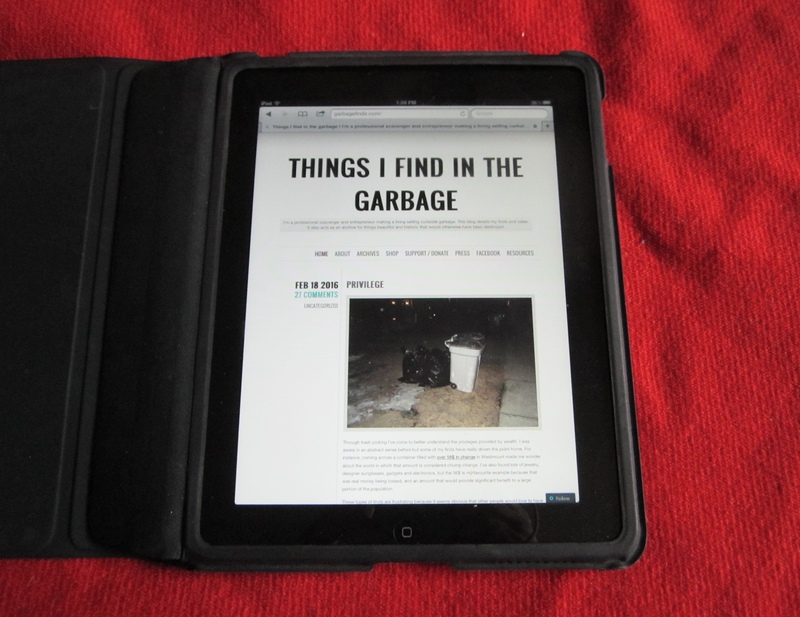 I found another original iPad, which I flipped recently on Kijiji for 80$. I guess we’re at the point now where working 1st generation iPads are being thrown out on a regular basis – I saved another one just this February. I used the photo of the last iPad here because it turned out a bit better. My best find though was easily this Macbook Pro. It’s an order of magnitude better than the last one I found. For one, it’s a 2012 model instead of a 2009, and it has a 15″ screen instead of a 13″. It came with the power cable, and even the battery works well. It’s easily a 600-700$ computer, and it’s definitely better than the Asus I bought last year. It was locked with a password when I found it. I’m not really tech savvy, but using Google I was able to find a way to bypass the password and basically delete the old account from the computer. 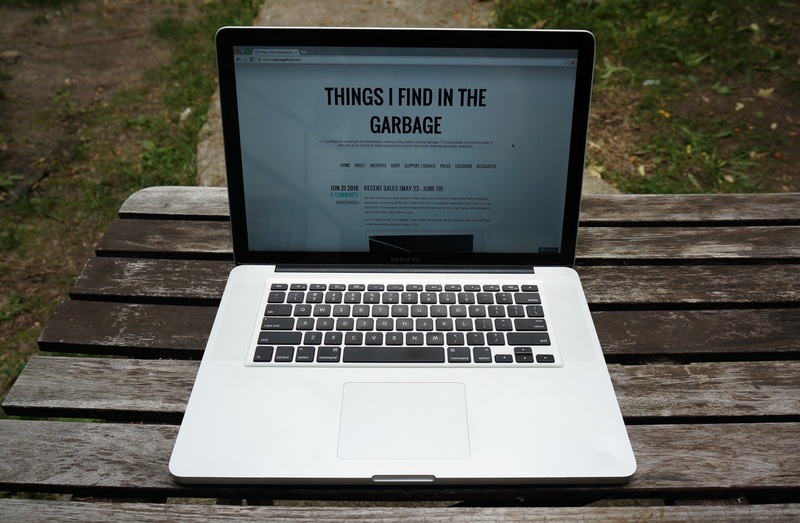 Apparently the laptop hadn’t been used since 2014, so I’d guess that the previous owner got a better computer and didn’t care about this one. Either way, it works out well for me! As you can see I had a great time on move-out day. I look forward to doing it again next year, though I don’t expect to get this lucky every time. In other news, I’m moving today so wish me luck! If all goes well I should have a bit of time tomorrow to check out moving day trash. To clarify, moving day is a totally different thing and a uniquely Quebec phenomenon. An interesting read, as always. Seems you chanced upon the right place at the right time. I hope your move is headache free. Yes. I can see the triangle in the middle, but nothing happens when I click it. The same thing happened with another of your GIFs. Probably something to do with my computer, though I don’t have a problem opening other GIFs. A mystery! Wow. Yet again you amaze and delight me as I read about what you have saved from a landfill or incinerator — beer, bracelets, an iPad, a laptop computer, cash!!! Clearly many of us human beings have little time to consider the possible consequences of our actions (both purchasing and then discarding things) for the next seven generations. I have a sense that you are helping to offset our greedy/thoughtless mindset/tendency/habits, however. THANK YOU. May your move go well! Great finds! In 1968 when I graduated from college I stayed an extra 3 days in the dorm after everyone else moved out (I was an out of state student waiting for parents to come for graduation) and I went thru the dorm – all 60 rooms, lounge, laundry room and bathrooms. Found tons of usuable clothes, linens, books, mainly texts to sell, dishes, silverware, a little money and I think some pierced earrings. Remember my parents remarking on how much I’d accumlated in my last year – never did tell them but it sure helped with my first apartment. Wishing you good luck with the move and much enjoyment of the new digs! I’d just never notice the perfume, unless the smell was too strong. Maybe ten years go I found a nice Mountain Equipment Coop shoulder bag when the students moved out. But it stunk, it smelled like someone had spilled a bottle of perfume in it. I had to wash it a few times before I got rid of the smell. Those scratch and sniff inserts in magazines for perfume are bad enough. I don’t know if you have one in Montreal but for your smaller flipping items you don’t want to list on EBAY or ETSY in the Comox Valley (BC) we have a 24 hr facebook bidding site. Thanks to your site/another sale on that site I was inspired to list a 12 year old HP laptop with dead batter (had cord) that something was not working correctly internally preventing it from hooking up to the internet. I am also not a techie so listed it with starting bid of free hoping someone could rescue it rather than just recycling it. I was able to wipe our information off of it as it was at least allowing that. It sold for $30! So even the old ones have some value. The facebook site is better than Craigslist or Kijiji as if you don’t show up to pay you get kicked out of the group so not so many flakes on there (just a few). Cheers and keep up the great recycling, I am glad you are able to make a living at it. I haven’t heard of anything like that in my area. It’s a neat idea though, glad it works for you. that is astounding that someone would just leave a Macbook behind. as always I love reading your blog. Santa Barbara California, USA. Moving Day happens here to. I have not personally checked it out but have read news articles about it. Amazing the things these kids leave behind. May 1st and Oct 1st are typically when apartment leases are up in Chicago. Both are huge moving days. It is understood if you leave stuff in the alley, it is up for grabs. Loads of folk stroll through the city looking for goodies. Alley picking is well known here, almost an exchange. Apparently here in Montreal “moving day” was May 1st, though I’m not sure how so many leases came to expire the same dy. But since the school year would be interrupted, there was decree that moved it to July 1st, after school ended. Would have been better to spread the end date around. But I’ve yet to see n explanation of why so many leases expired on the same day. When demand is high, it’s probably more expensive to get a mover, and likely harder too. On the other hand, if your lease expires, you need a vacancy in order to have a place to move to. I once helped someone move on July 1st, she was actually just swapping with the larger apartment next door. We basically moved things through the front doors while the neighbor moved via the balcony. And yes, in areas of high student density, there does seem to be more scavenging. It’s common to see young people walking down the sidewalk with their friends carrying furniture. They my just be moving some of it, but some has to be scavenged. The advantage is it’s a small area, easy to carry the furniture. I’ve seen desks that I’d have liked, but too big to carry far. At some point I’d like to do a garbage road trip, and I’d love to see Chicago (and its trash). Lots of history there! If I visit I’d probably make a point to actually miss those days, because there’s usually a lot more competition. Good Luck on your move!!! Enjoy seeing all the things you find and save!! !